The mousepad is 7-3/4″ x 9-1/8″ and is made from stain-resistant high density foam, nicely cushioned and just right for any type of mouse to smoothly roll over the surface. Shipping is included. 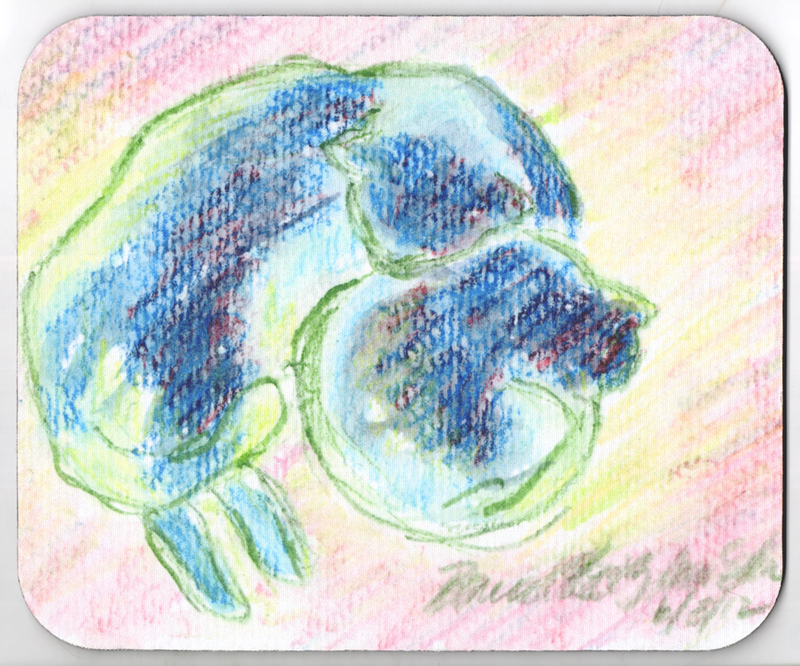 “Mother and Daughter, Sun and Shadow” is one of my daily sketches from last June when I was still experimenting with my watercolor pencils, mixing my love of simple sketches with the ability to blend colors, though not with my fingers as I am accustomed with my other familiar dry media of pastel, pencil, charcoal and the like. I sketched the basis of this, Mewsette and Mimi curled together on that pink flowered rug in a patch of sun on the upstairs landing, then ran a wet watercolor brush over it, just water, and let the colors blend as they would, magically turning my sketch into something I had not visualized. These two were curled up together on the rug on the landing, in very diffuse sunlight, not the bright morning light we often have, but it reflected off the white walls and created some interesting color combinations in their fur as well as reflected areas. Nice composition they made, and I wasn’t quite sure what I wanted to do with it at first, but I’m glad I chose watercolor for its opacity. In creating my Daily Sketches of my cats I experiment and work in a different style and medium each day. You can read more about these three sketches and other on The Creative Cat (www.thecreativecat.net). See other mousepads under Gifts Produced from My Designs. This entry was posted on December 5, 2016 by Bernadette.